Next week, Digital Summit will arrive in Minneapolis, drawing in distinguished speakers and attendees from far and wide while placing our hometown at the center of the marketing world for a few days. Whether you’re coming into town to join the festivities, or simply curious to learn more about the Twin Cities and why TopRank Marketing is proud to be planted here, let this post serve as your guide to the Mini Apple and beyond. If you’ve seen the movie Fargo or other representations in pop culture, you might be led to believe we Minnesotans are a bunch of hot-dish devouring, “OHHH-kay den” saying, lutefisk loving northerners. It’s… well, alright, it’s not all THAT far from the truth sometimes. But this state, and its star cities, have much more to offer than the goofy stereotypes might have you believe. Minnesota isn’t just the Land of 10,000 Lakes. It is also a land of innovation, ambition, and inspiration — and, consequentially, a haven for marketers. Did you know that the world’s first successful open heart surgery was carried out at the University of Minnesota, or that our state pioneered the shopping mall? Minny is an ingenuity hotbed, always one step ahead of the curve with a thriving tech startup community that has led some to suggest MSP might be the next Silicon Valley. St. Paul is home to 3M, a global icon for invention and innovation. Minneapolis has been named one of the 10 greenest cities in America (TopRank CEO Lee Odden, an outspoken advocate for sustainability and environmental initiatives, especially appreciates this.) The Twin Cities are among the country’s leaders in bicycle accessibility and amenities. Rent one and find out! Beyond 3M, numerous corporate powerhouses are headquartered here in Minnesota. These include Fortune 500 companies like UnitedHealth Group, Target, Best Buy, U.S. Bank, General Mills, and many others. Being surrounded by so many nationally renowned businesses helps our TopRank team stay motivated to be top-of-class in all that we do. The bar is set high. Everything about our setting helps us feel inspired on a daily basis. You don’t have to venture far from the urban metropolis to find lakes, rivers, and forests. We get all four seasons, and the weather can change drastically from one day to the next, so there’s never a dull morning. The sounds of Prince, Bob Dylan, and The Replacements helped form the foundation of a lively music scene. “Creative” is part of our mission statement at TopRank Marketing and being immersed in this versatile culture helps to fuel imaginative minds. Burgers. We’ve got some incredible ones. If you’re staying downtown, I highly recommend trying the Parlour Burger, or Red Cow in the North Loop. If you’re willing to venture a bit further, try a Jucy Lucy from Matt’s Bar or one of the many delicious creations at Blue Door Pub. Beers. Ever had a Grain Belt Premium? It’s one of our state’s oldest signature beers, although these days, Surly is leading a local microbrew boom (if you like IPAs and haven’t tried a Surly Furious, it is a must). There are plenty of breweries within driving (or even walking) distance of the Guthrie Theater, where Digital Summit is taking place. Try Fulton, Modist, or Inbound, all located in the nearby Warehouse District. Ball. The Twins are in town next week, and will be facing Cleveland on Tuesday and Wednesday night at Target Field (just a few blocks from the Guthrie). Outdoor baseball during summer in Minnesota is as good as it gets. If you wander in that direction, we also recommend checking out First Avenue, the legendary music venue adorned with stars commemorating famed bands and artists who have come through over the years. Beauty. If you have a free afternoon, I can’t recommend this activity enough: head to Lake Calhoun (about 10 minutes from downtown). Rent a canoe or kayak, and take it out into the chain of lakes for a few hours. While still essentially right in the middle of a bustling city, you can escape to the calming serenity of these gorgeous locales, taking in amazing views of the downtown skyline and spectacular neighborhood architecture. I’ve never experienced anything quite like it elsewhere. And, Of Course, the Featured Speakers at Digital Summit. The Digital Summit speaker list is a star-studded stable featuring some of marketing’s brightest minds. We can’t wait to check out Seth Godin, Ann Handley, Neal Patel, and many others (which we’ll be sharing more about next week). Today’s savvy consumers are notoriously picky eaters when it comes to the content that they consume. And learning all of the different recipes and tricks to successful content can be a grueling process. To help you along the way, we’ll cook some tried and true recipes that will satisfy your customer’s cravings for better content. Content is both king and kingdom in the marketing world but what good is great content if no one sees it? Confronted by information overload, distrust in advertising and the growth of ad blocking, successful companies are adding an essential ingredient to their content marketing mix: influencers. By co-creating content with trusted experts that have active networks, brands increase both quality and quantity of credible content that is trusted by customers and stands out from the competition. In this presentation, Lee Odden will outline a framework, best practices, tools and examples for integrating influencers with content marketing that will help marketers attract, engage and convert more customers. If you happen to catch any other TopRank Marketing team members roaming around (we’ll be in full force), please don’t hesitate to say hello! Out of all the stereotypes attached to our state’s citizens, “Minnesota Nice” is probably one of the most accurate. We’ll prove it. Bonus: Exclusive Supercharged Happy Hour for Digital Summit Attendees! If you’re looking for a way to connect with other event attendees, snap up your ticket for our Supercharged Happy Hour at the Aloft WXYZ bar. The first 50 people will get a free cocktail and have an opportunity to mingle with some of the speakers and attendees from the Digital Summit. 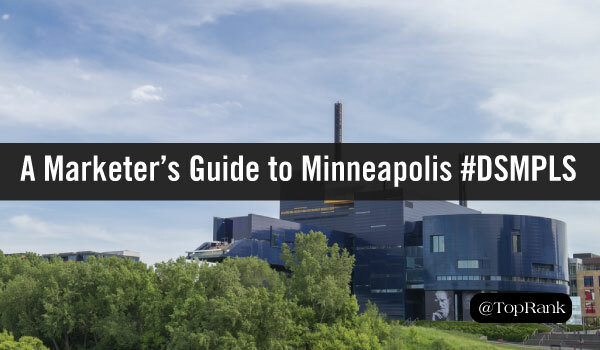 The post A Marketer’s Guide to Minneapolis: Gearing Up for #DSMPLS + Exclusive Event Invite appeared first on Online Marketing Blog – TopRank®.